Home ParentingRaising BoysOscar	Santa!!! Santa’s Coming! I KNOW HIM!!! I hadn’t planned to get a picture with Santa but today was just the perfect storm of events so we took the plunge! Oscar and I went to the mall in search of adventure and pajamas, what else? 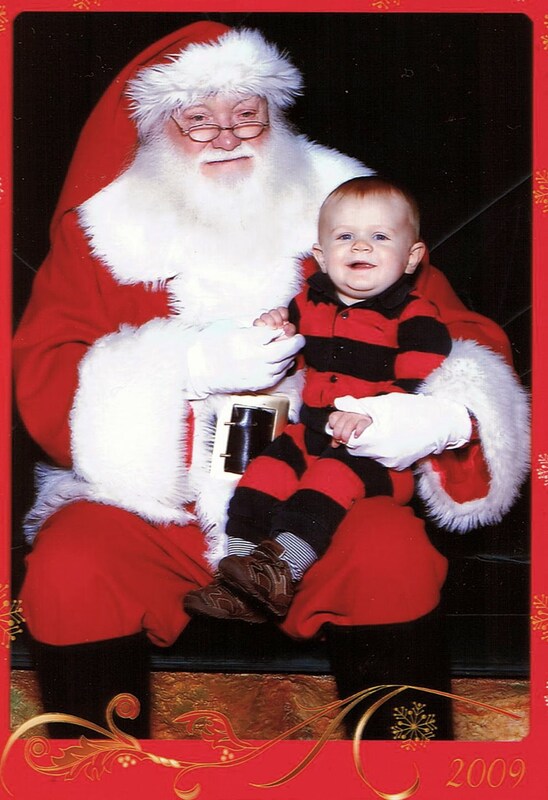 Once there, he was absolutely fascinated with Santa workshop and the big giant reindeer. We circled it a few times on our way to various stores, but noticed that there was NO line. Oscar also happened to look pretty festive in a red striped jumper so I decided to go for it. He didn’t seem to care much about Santa but kept pointing at different things all around trying to touch them. I stood behind the camera and helped get him to smile. It was fun and awkward to do all my “noises” in front of strangers. But mostly fun. Cuuuuute. Santa doesn't even look too sketchy here. Ha ha ha (about making your noises in front of strangers). What a cute picture!